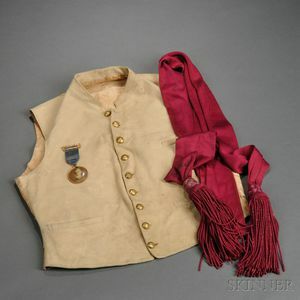 Vest, Sash, and Veteran's Medal of Lt. Robert A. Hall, c. late 19th century, white twill-woven vest with eagle I buttons, lined with plain-woven white cotton sheeting, crimson officer's sash, embroidered near knot with R.A. Hall, veteran's reunion medal with a picture of Lt. Hall which reads TWENTY-SIXTH/REUNION/141ST N.Y.V./ELMIRA, N.Y./SEPT. 12, 190[...]/PRESIDENT/LIEUT. R.A. HALL. Note: Hall enlisted in company I of the 141st New York on September 10th, 1862, made lieutenant September 11th, 1862, and was discharged for disability on January 10th, 1863. Vest has a few moth nips and some soiling around collar, medal has a little fraying on ribbon.